General Motors has announced that it will be investing $494 million into the next generation Ecotec engine. There has yet to be an announcement as to what form the engines will take, but the engine is currently offered in 2.0L, 2.2L and 2.4L variants that come standard in many of GM’s current vehicles – inluding the new Terrain/Equinox and the Buick LaCrosse. Most of the money – $425 million to be exact – is going to the Tonawanda, NY engine plant, and that investment will also create 470 new jobs at that plant alone. The remaining cash will be split up between GM plants in Defiance, Ohio and Bay City, Michigan – with $59 million and 80 new jobs at the Defiance plant and $10 million with 15 new jobs in Bay City. The investment in Tonawanda, supported by the investments at Defiance and Bay City, will go toward producing two next-generation Ecotec engines. The new engines will have additional capabilities to improve fuel efficiency and improve performance through advanced design and by adding technology. 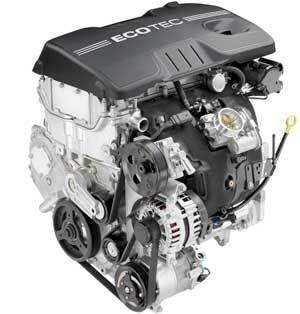 The Ecotec engine family is known for its reliability, fuel efficiency and performance. GM Ecotec engines have been on the forefront of delivering leading edge technology including direct injection, variable valve timing and turbocharging. Direct fuel injection, a hallmark of many Ecotec engines since 2007, is just now becoming mainstream technology in the industry. The current Ecotec 2.4L with direct injection and variable valve timing in the Buick LaCrosse, Chevrolet Equinox and GMC Terrain was recently recognized as one of Ward’s Auto World magazine’s 2010 “Ten Best Engines” for North America based on several factors, including power, fuel efficiency and new technology. The Ecotec is currently available in 2.0L, 2.2L and 2.4L displacements. For competitive reasons, specifics about the engine capabilities as well as product applications will be shared at a later date.